Professional House Cleaning Services in Chanhassen & Eden Prairie. Deep cleaning protects your family’s health. Is the cleanliness of your home putting your family's health at risk? Superficial house cleaning can leave behind deep-rooted contaminants. That’s why our professional deep-cleaning teams are trained and experienced in eliminating these harmful contaminants from your home. Our quality micro-filter vacuum system removes over 99% of airborne contaminants, including mold, bacteria, and fungi. Deep cleaning protects your family’s health. We know a healthy living environment is important to you. 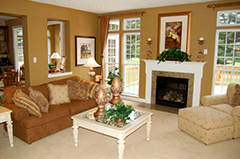 We also understand your home needs to look clean. Our top-to-bottom deep cleaning service means if we can see it, we clean it. Every surface. Every inch. Every time. Our custom home-cleaning solutions fit your schedule, your needs, and your budget. House Cleaning Services Include: Vacuuming upholstered furniture; cleaning luxury counter surfaces, baseboards, window sills, ledges, and door frames; as well as professional floor cleaning for your carpets and hardwood floors. 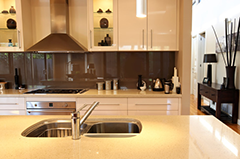 Kitchen Cleaning Services Include: Sanitizing counter tops, sinks, and stainless steel appliances; cleaning your hardwood and laminate flooring; dusting picture frames, baseboards, door frames, window sills, and ledges. Bathroom Cleaning Services Include: Scrubbing and sanitizing toilets, showers, bathtubs, shower doors, sinks, floors, tile wall, mirrors, vanities, baseboards, ledges, and door frames. Are your hardwood floors in need of updating? Check out our partner B & R Hardwood and Tile.